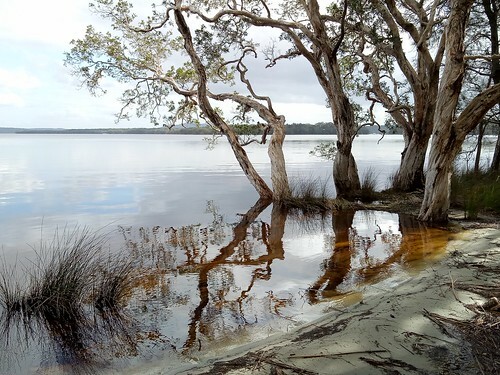 Like many of you, the first time I read about Myall Lakes was from the Lonely Planet. 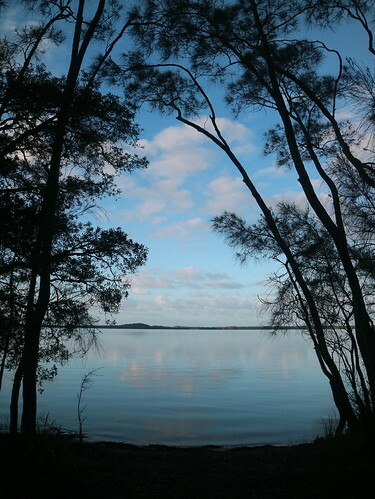 They’re one of the 3 Great Lakes, named Wallis Lake, Smiths Lake and Myall Lakes. It may seem like a deviation from the theme of sand dunes, but bear with me for a while. I didn’t tell the kids that going to Myall Lakes National Park would be a challenge without our own transport. Actually, the park lies just north of the last major settlement of Tea Gardens – which, as the crow flies, is just opposite Nelson Bay. 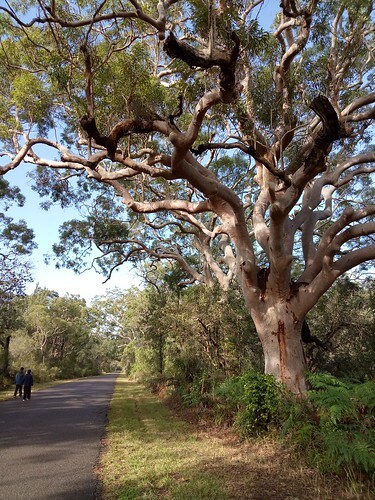 It is accessible inland on the Pacific Highway or alternatively, by ferry from Nelson Bay. 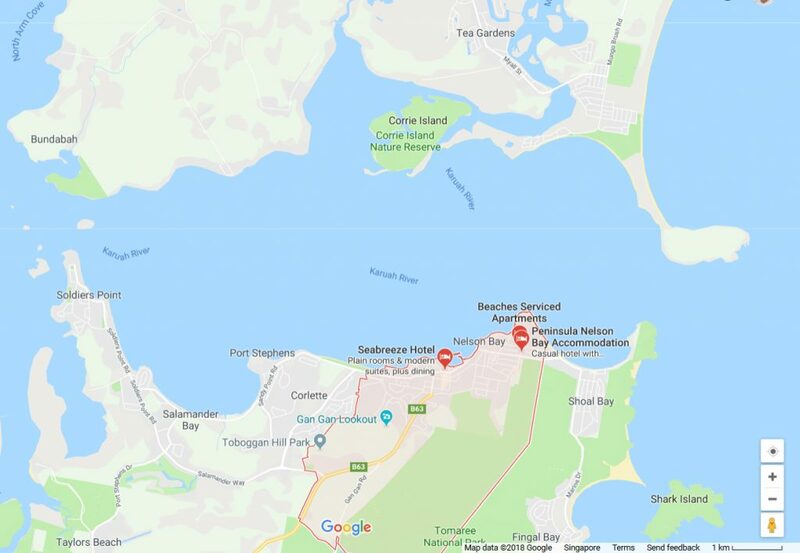 Our quad bike guide told me that it would be easiest to get a taxi to Myall Lakes from Tea Gardens and since there is a bus going to Tea Gardens from Broadmeadow, I decided not to waste time waiting for the ferry which has a pile of bad reviews on the internet. So on another cold rainy morning, we took the bus from Broadmeadow to Tea Gardens shopping area and to my dismay, our quad bike guide was wrong. There was no Uber at Tea Gardens. I called up the accommodation I’ve booked and they came up with a brilliant plan. One of their staff would drive out to meet us and then bring us in (for a fee). With no other alternative, I agreed. Like I always say, when there’s a bill, there’s a way. About half an hour later, a lady in an oversized jacket called my name as I passed by the supermarket. She introduced herself as Diane and she urged us to get some food as there was only a simple cafe at Myall Shores. She then followed us inside and when she saw me grabbing only noodles, bread and biscuits, she reassured me that there was refrigeration and proper cooking facilities at the holiday park. I eagerly grabbed chicken, kangaroo meatballs and satay instead. The drive from Tea Gardens to Myall Lakes took about half an hour. It was a narrow road with hardly any traffic. On the left was a forested area close to the edge of the freshwater lakes. On the right was a sandy embankment guarding a vast expanse of sandy beach which led to the sea. We were travelling on a thin strip of land between two similar yet very different, watery worlds. 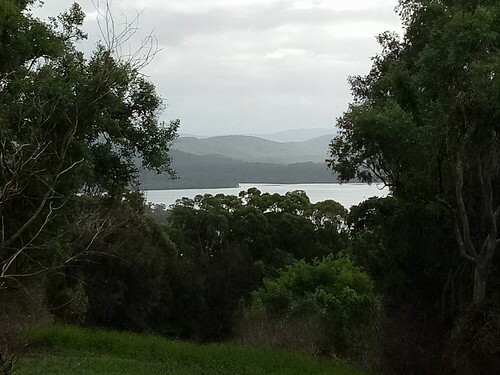 Presently, we arrived at the crossing point on the lake, also known as Bombah Point. 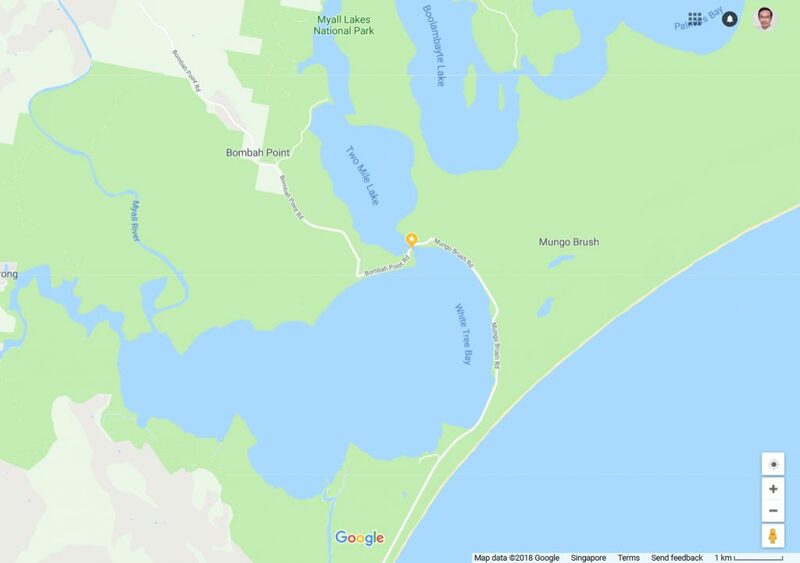 This is the neck between two lakes. Right across the water was Myall Shores Holiday Park where I’ve booked a a very comfortable, practically self-sufficient (save laundry) cabin for two nights. The ferry is actually a floating platform tugged both ways by cables. It looked rather primitive, but it was sturdy enough to take vehicles. Admittedly, it’s not very high tech, but sufficiently functional, given that this is not exactly the Sentosa kind of traffic we’re talking about here. But the best part about the ferry was not the hardware but the software. The elderly gentleman operating it was incredibly friendly and enthusiastic, playing the park’s unofficial information counter. The manager Scott, checked us in and even long before Crazy Rich Asians, he already had the impression that we were filthy rich. The cabin was a beauty. 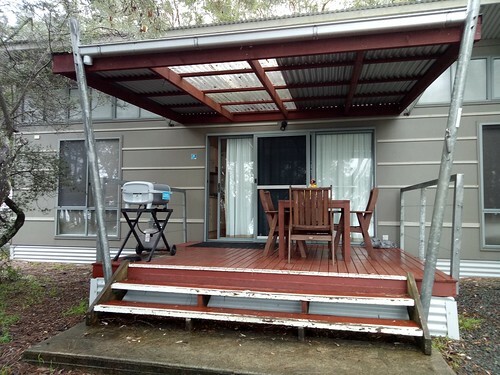 There were 2 bedrooms, a living room, a kitchen area and a veranda – perfect for a small family. But of course, not being typically Singapore, the main attractions for me were not inside but outside the cabin. In spite of the drizzle, the sense of space in that endless stretch of water before us was spectacular. The lakes were vast and unfettered, without much of the harsh and jarring “value-added” structures to sell the concept of ecotourism. The trees have mostly been left alone, so much so that nobody seemed to be bothered that they were growing the “wrong” way or appear to be walking into the lake. There were kangaroos everywhere. 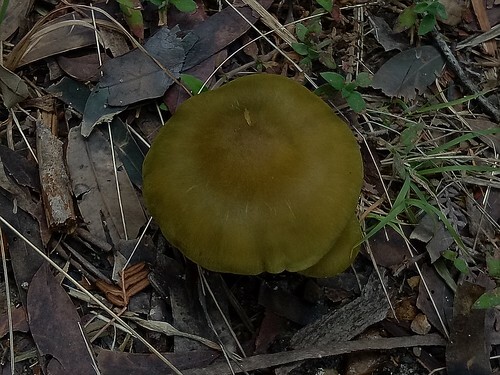 You would certainly run into at least a couple of them as you explore the surroundings. It’s not hard to imagine that they are over-populated. And though these creatures are quite smart, they have never learned to read. 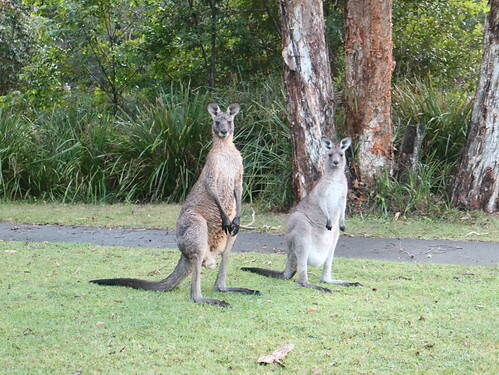 Otherwise, we wouldn’t know how they might react to folks bringing kangaroo meatballs into the park. This being winter, I only had a few hours of daylight to explore our side of the lake all the way to the reception area. 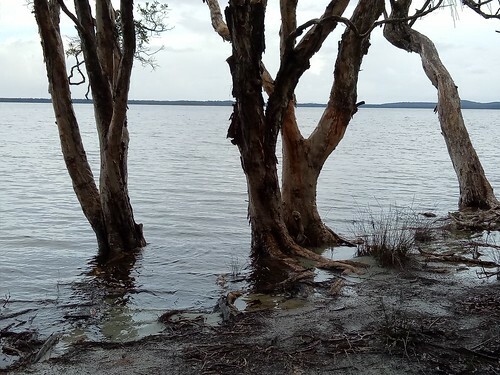 And when the ferry at Bombah Point had stopped operating, the drizzle petered out and all we could hear were the birds and the clinking of bottles at the cafe. Kangaroos gathered as if to share body heat. 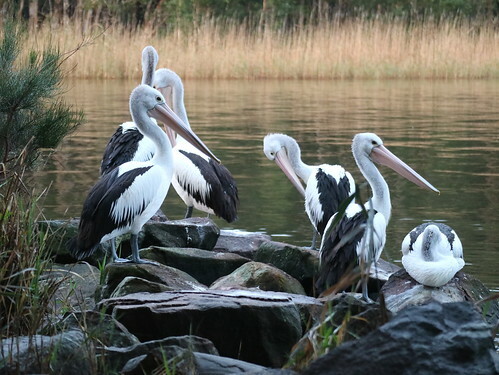 Ducks waddled across the field and a flock of pelicans congregated on a pile of rocks just next to the crossing point. A deep sense of tranquility descended on the lakes. From the reception area and cafe of the holiday park, a floating jetty stretched out onto the surface of the lake. Sunset on the first evening was a sloppy mix of random colours. The clouds had stubbornly lingered on after the rain, warning of more rain to come. I rushed back to make dinner and with no entertainment in the dark wilderness, we went to bed early. The next morning saw fine weather. There were few clouds and the floating jetty sat on a glassy surface, but that was about it. There was only a slim chance of rain and perhaps as with the quad bike ride, we got lucky again. It was a perfect day for a hike and I chose to go to Johnson’s Hill. Where did we get our directions? From the ferry man of course. He took out his map, explained in detail all the places we could visit and even asked us to keep the map even though that was the only copy he had at the moment. We also got to ride free on the ferry. The sealed road gave way to a dirt track after we made a turn from the main road. 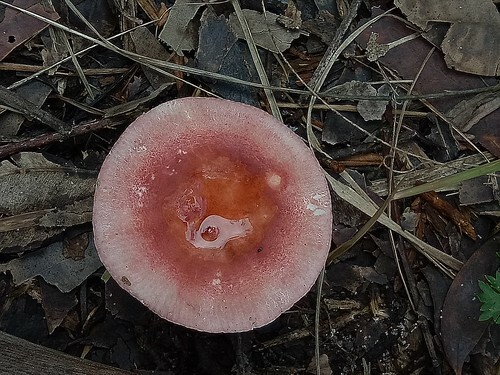 Thanks to the rainy weather, pools of tannin-stained water had collected at many spots along the dirt track. 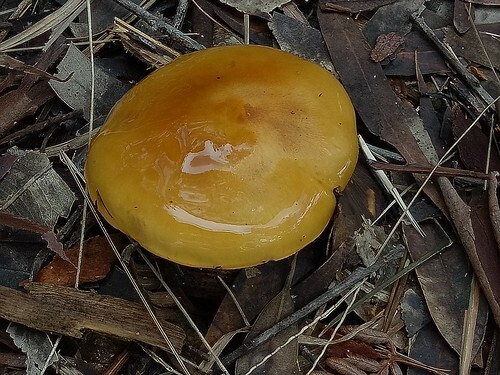 The trees here exuded a reddish brown, rubbery resin from what appeared like stab wounds on their barkless surfaces. 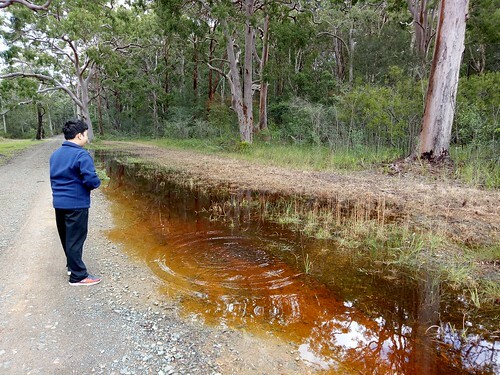 The water from the taps at Myall Shores was likewise brownish, but we were reassured that it’s not a health concern. 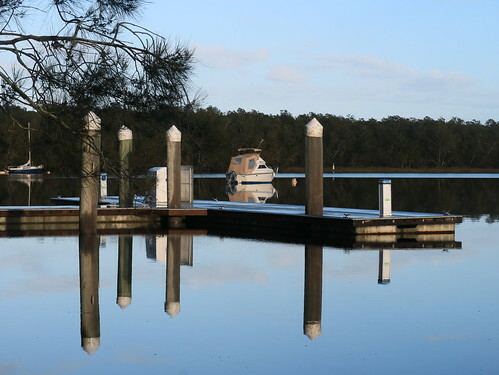 It is believed that Tea Gardens was named after the colour of the water from the Myall River and not tea plantations which were nowhere to be found. It took us almost 2 hours to reach the top of Johnson’s Hill. The actual climb was short and not particularly steep and the view was okay, but as you can see, nothing spectacular. It would have been great if it could be higher and if there could be fewer trees. It was a long walk back to our cabin for a very light and late lunch. 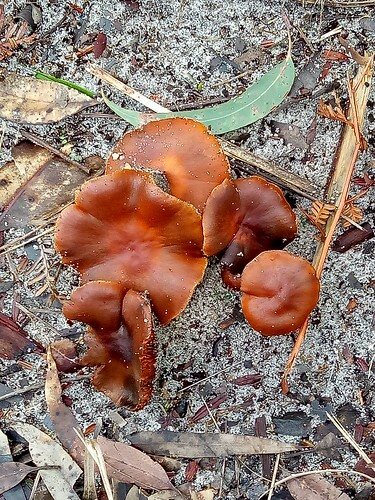 Apart from the birds and the trees, another thing that struck me about Myall Lakes was the interesting variety of mushrooms. 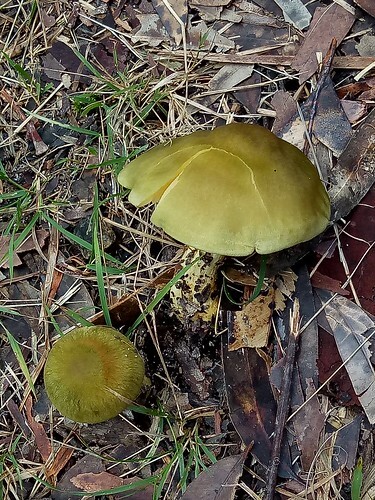 I doubt they are edible, but they are so colourful and beautiful, feeding on a strange, colourfully rotten diet. You could find two completely different species just a few feet apart. Just before I prepared dinner, I called Diane to arrange transport for the next day. She gladly agreed – for the same fee. 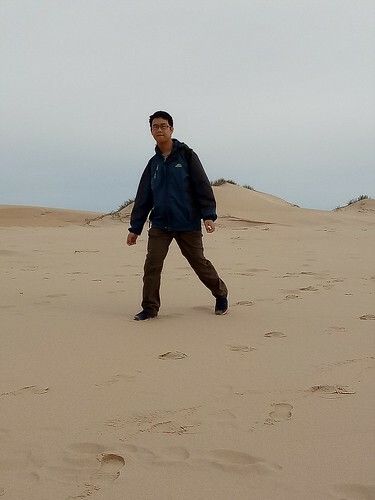 This time, I boldly bargained for a brief stopover at Dark Point – our next dune site. The second night was a bit warmer, probably with a bit of help from Scott who brought a bottle of organic Hunter Valley shiraz over. It was pricey, but very good with the satay I grilled. We were greeted next morning by a kookaburra on our porch and several kangaroos casually feeding just outside our cabin. It wasn’t raining, but it was rather cloudy. I ordered the kids to pack up and soon, Diane was there and ready to take us to Tea Gardens. She brought her daughter along this time. I had decided to take the ferry from the pier at Tea Gardens on the return trip (towards Newcastle) as my next destination was not Broadmeadow but Anna Bay. Diane drove off from our cabin and we crossed Bombah Point in high spirits, waving farewell to the kind gentleman operating the ferry. On the way out of the park, Diane stopped at Dark Point as promised. Dark Point (an aboriginal place, is actually a small peninsula sticking out into the Tasman Sea. The entrance was clearly marked with a small parking area next to it. From there, a sandy path led the way into a sea of sand. 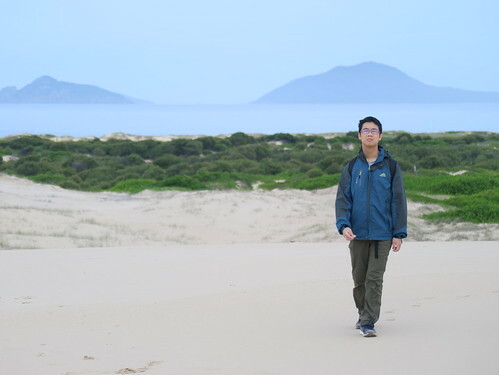 It was just a beach, but it had massive, desert-like sand dunes just like the one at Stockton Beach. Yes, it’s a beach disguised as a desert, but many days of wet weather had not only compacted the sand but also fed mats of grass over many places, spoiling the disguise. 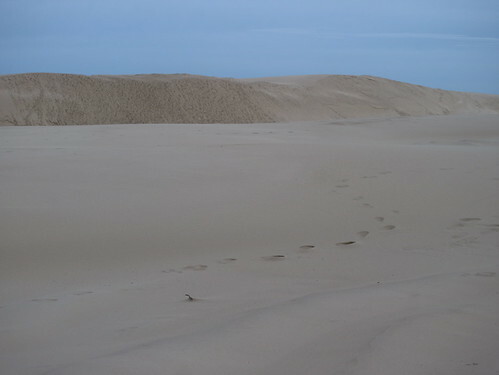 The boys and Diane’s daughter went up on the dunes, fascinated with the huge volume of sand. If dry, the wind could whip up dynamic dunes that could really fool the eyes into seeing a Sahara. We arrived at the jetty at Tea Gardens when the boat was just about to leave. Diane ran up to the boatman and asked if he could wait for us. He readily agreed and so did everyone on the boat. With a little help from the ladies, we loaded our backpacks on the boat and were soon off to Nelson Bay.